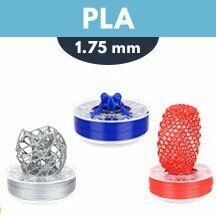 PLA 1.75mm filament for 3D printing and available in numerous coloured spools. With a diameter of 1.75mm, this PLA filament is the simplest to print of all the filament types. It does not necessarily require a heating plate on your printer. PLA 1.75mm filament is ideal for beginners in 3D printing because it guarantees consistent and detailed results without constraints. This PLA 1.75mm filament only works with 3D printers that take 1.75mm diameter PLA. You’ll find all the brands and the widest selection of products in our specialised store, with guaranteed quality for your online purchase. To buy PLA 1.75mm, see our PLA 1.75mm buying guides, and check out all the advice from our experts. Pack of 50g PLA samples in 5 different colours to test the quality of PLA Neofil3D. Supplied in rolls. Hulk, Ninja Turtles – they’re all fans of this intense green colour. ColorFabb PLA is a premium PLA manufactured in the Netherlands. It is 100% biodegradable and developed for excellent quality 3D printing. ColorFabb PLA comes in a 750g spool. A neutral colour between black and white. With just a hint of blue-grey, this PLA is one of the classic colours. ColorFabb PLA is a premium PLA manufactured in the Netherlands. It is 100% biodegradable and developed for excellent quality 3D printing. ColorFabb PLA comes in a 750g spool. Neutral but definitely not boring, this standard white filament has a creamy look. ColorFabb PLA is a premium PLA manufactured in the Netherlands. It is 100% biodegradable and developed for excellent quality 3D printing. ColorFabb PLA comes in a 750g spool. The absolute favourite among all the filament colours: standard Black. By far the most popular colour in 3D printing. ColorFabb PLA is a premium PLA manufactured in the Netherlands. It is 100% biodegradable and developed for excellent quality 3D printing. ColorFabb PLA comes in a 750g spool. Bright red like traffic lights. To print a demon from hell or an Italian sports car in 3D, traffic red won’t disappoint. ColorFabb PLA is a premium PLA manufactured in the Netherlands. It is 100% biodegradable and developed for excellent quality 3D printing. ColorFabb PLA comes in a 750g spool. This shade of white is classic and pure. This white is cooler and not as creamy as the standard white. ColorFabb PLA is a premium PLA manufactured in the Netherlands. It is 100% biodegradable and developed for excellent-quality 3D printing. ColorFabb PLA comes in a 750g spool.